Chef Brylie Winston has made some mistakes in her life, but she didn’t think she’d repeat one. She didn’t realize the man whose bed she left this morning after a rare impulsive night of passion was her boss. Worse, he owns the cruise ship where she works, and of course, he’s on board for their trip to Antarctica. And instead of being pissed that she snuck out on him, he seems determined to have a repeat performance. Marcus Devlin knew his family would make good on their threat to send him to the ends of the earth some day. He didn’t think it would be quite so literal, sticking him on a cruise ship to Antarctica, after his latest scandal. Time for him to learn the family business. Things look up when he spots the gorgeous redhead from last night. If he thought it would be smooth sailing, he was sadly mistaken. This book certainly was an entertaining adventure! Not really my style, but I enjoyed it for the most part. What I really would have loved to see done differently was all the plots pulled together more cohesively. As it is it goes pre-pirates/post-pirates/pre-rescue crash/post-rescue crash, then the end. But wait! The romance! Let's throw a HEA in there with a pretty bow on top! Although, I'm not sure if there is even a HEA… there's no declarations of love or anything. But yeah, it would have been nice had everything flowed together better. It wasn't bad though! Just after the pirates ordeal was resolved it felt like I was reading a completely different book with the same characters. There were pacing issues after the pirate ordeal as well, but I think that's my issue, because it felt like the book should have been done there (think it was at the 56% mark, but don't quote me on that). It felt like it was dragging on and on. This was an enjoyable book nonetheless. And the author certainly knows how to do action and suspense. 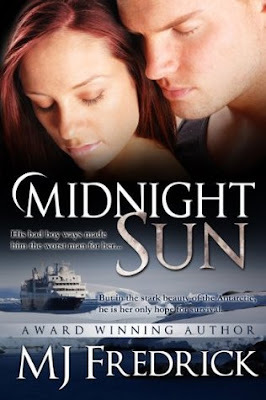 I'm glad I read Midnight Sun, but I'm glad I'm done with it. Would I recommend it? Absolutely, if you love romantic suspense in unusual locales, it doesn't get any more unusual than Antarctica!